BLOOMINGTON - A half decade before hundreds were gunned down at the Bataclan concert hall in Paris, before suicide bombers had hoped to lure thousands of soccer fans out of the Stade de France at St Denis, there was the commencement of operations at the Shchuch'ye Chemical Weapons Destruction Facility (CWDF) out in Siberia. With the collapse of the Soviet Union 1991, with its nuclear and weapons specialists unpaid, a nightmare scenario unfolded inside the new Russian Federation. It possessed the world’s largest stockpile in chemical and biological weapons. Russian sources were tipping off U.S. Sen. Sam Nunn of Georgia about a potential catastrophe. Near Schuch’ye east of the Ural Mountains and at six other weapons depots there were 2 million 85 mm shells containing nerve agents such as Sarin, Soman and VX, a weapons cache that would make any terrorist bomb maker salivate. Partnering with U.S. Sen. Richard Lugar, the two senators created one of the greatest congressional level achievements, the Nunn-Lugar Cooperative Threat Reduction Program. At Shchuch’ye, this meant the construction of the facility that would break down these weapons and store them for eternity. The United States contributed $1.039 billion for the planning, facility/process designs, equipment procurement/installation, construction and systemization of the Shchuch'ye CWDF, which opened in April 2009. 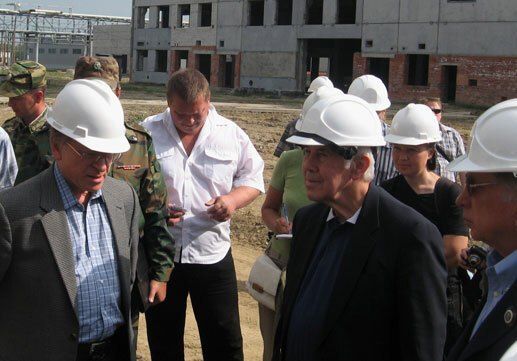 It matched a real message that Lugar would repeatedly deliver during his 1995-96 presidential campaign and beyond, that we faced “the destruction of an American city in our lifetime.” In 2007, Nunn and Lugar traveled to Shchuch’ye for its official opening and the stories of a potential disaster were discussed. The Soviets had made enormous amounts of these deadly agents and kept absolutely no inventory. Finding them would have been a dream for any terrorist. Shchuch’ye program manager Paul McNelly described the decrepit buildings not much more sophisticated than chicken coops where “you could see light coming through the walls and ceilings.” The weapons were surrounded by a degrading wooden fence. There were no guard towers, no breach monitors, no inventory lists. “There hadn’t been in history this type of cooperation, this kind of addressing security problems together by bitter enemies without military defeat,” Nunn said. Lugar and Nunn had conversations with the Soviets over the previous five years. Future defense secretaries Ash Carter and Bill Perry would assume roles in the Bush41 administration.